The opinions below are all mine & I am thrilled to share about my favorite piece of jewelry. Many thanks to Lisa, the owner of StudioJewel, for the $75 gift card to her shop. I realized He was holding me in the palm of His hand. He cared more than I could imagine. But I needed a daily reminder. I wanted to be reassured. I did not want to get so desperate as to do something stupid. So I gave myself a reminder. A permanent one. I had the words tattooed to my wrist… CHILD OF GOD. I AM a daughter of the King. He created me. He cares for me. Even if NO ONE else does. And EVERY time I see my tattoo I smile and feel that reassurance. Lisa created a ring that matches her Child of God tattoo and through that tiny piece of metal she shares her story and her heart with others. What a blessing! I’ve had my Child of God ring for about a year and a half and I can’t remember one day when I haven’t had it on. For me it’s almost a talisman of sorts, a tangible reminder that I am indeed a child of God. I touch it when I need to utter a silent prayer. I twirl it around my finger when I need encouragement. 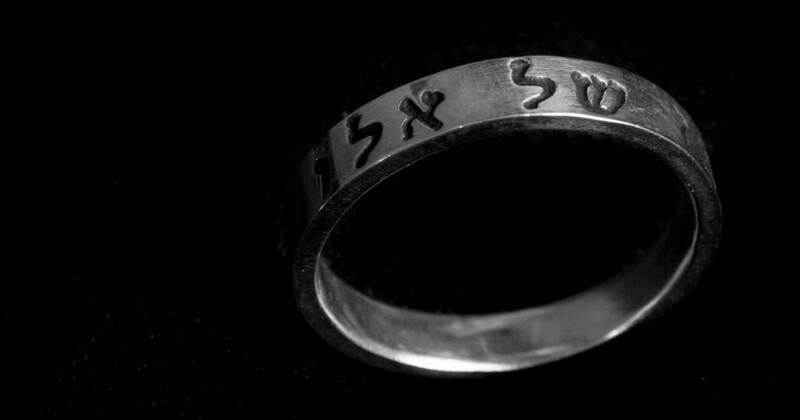 I roll my finger over the grooves of each Hebrew letter when I’m nervous. Each of those a reminder that I’m not alone. That I am loved. That I am a Child of God. 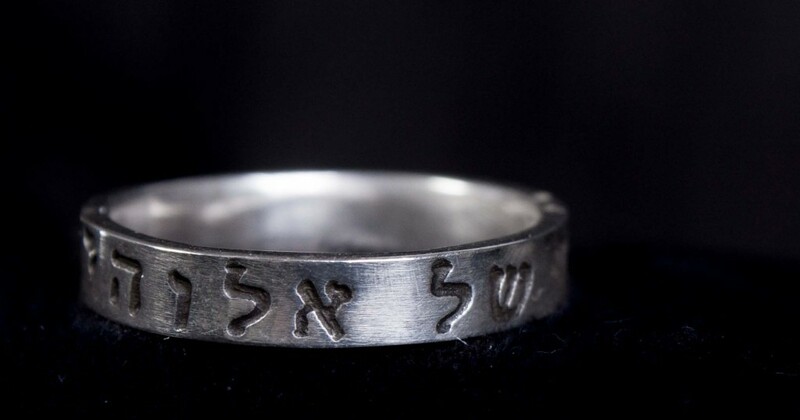 But it’s not just the Hebrew letters or the simple and beautiful craftsmanship that makes StudioJewel jewelry so special; it’s the heart and passion behind each piece of jewelry that Lisa designs. She is an artist and each piece of jewelry is a masterpiece. Just look at all the beautiful pieces! Especially this one, the bracelet that will someday be mine. Someday! Think of how sweet it would be with a bit of Proverbs 31 on the bangle and a tag for each of my babies. I’m sure you saw something you loved. What was it? Would you like to win a $75 gift certificate to Lisa’s store? There are 6 possible ways to enter, but you must do the first one for the others to count. Each entry must be in a separate comment. The giveaway will run until 11:59pm EST on June 30th. Winner will be chosen using Random.org and will be notified by email. If winner does not respond within 24 hours, a new winner will be chosen. To enter you must leave one comment (not on Facebook but in the comment section below) letting me know which Studio Jewel piece you love the most. Pin this post on pinterest and leave your pin url in the comments below. “Like” StudioJewel on Facebook and then leave a comment below letting me know that you did. Follow StudioJewel owner Lisa on Twitter and then leave a comment below letting me know that you did. Follow StudioJewel on Pinterest and then leave a comment below letting me know that you did. I am loving this jewelry. It’s perfect for someone like me who is not “girly-girly but still likes jewelry with meaning. Happiest of Happy Birthdays, Friend! I hope your day is spectacular and that you are blessed in ways you could have never imagined. Ooh, I love that Child of God ring. That is perfect!!!! I really like the wrap bracelets! The Mom stacking bracelets are pretty awesome as well! I liked StudioJewel on Facebook. I pinned this on Pinterest but I can’t figure out how to put URL from my iPad. I love the Mommy necklace and the leather bracelet with the silver cross. how do you choose?? I love the “mom” necklace, the aquamarine and silver ring, and the “pretty in pink” earrings- and of course, LOVE the child of God ring! I love the aquamarine engagement ring the best. Her wedding sets are stunning. Shared on fb (tagged you). Can’t grab url on my phone. I love her stuff! I follow her on instagram and love seeing her creations. I could go for any of her earrings but I think I love the mommy necklace the best. Oh, but I always love her pictures of her bracelets too! The child of God ring sounds perfect for me! Her testimony about what this means to her touches me in a special place. I love the silver circle earrings! I like Studio Jewel on Facebook …. Lisa is one of my favorite artists! I have several of her pieces and I wear my bangles from her every day. I would love to get something with my children’s names on it. I like Studio Jewel on FB! I follow Studio Jewel on Pinterest! I love so many things – but I think the mom stacking bracelet is beautiful! That is beautiful! Liked on Facebook and followed on twitter. I like the earrings, especially the blue gemstone ones! I love the ring you got from her. She has a sweet powerful story as well. I would love to have something made by her hands! I LOVE the Child of God ring! Such a beautiful reminder of a great truth! I followed @StudioJewel on Twitter! Pretty in Pink bracelet, Mama’s bracelet or maybe the “child of God” ring (I suffer mightily too). It is all so lovely. My favorite is the layered silver and leather bracelet. As a metalsmith myself, beautiful work. Love the Mom stacking bracelet. Will get that for Mom. Liked it. That is most likely all I will be able to do :). I followed Studio Jewel on Pinterest!